Guests can choose between deluxe housekeeping cottages or a camping vacation. In the spring, we cater to the fishermen who fish for trophy lake trout as soon as the ice leaves the lake. Summer brings families to our resort to enjoy a memorable vacation. Whether in one of our deluxe cottages or camping amongst the trees, memories are made here! In the fall, the pace slows down; we invite you to join us for the beautiful fall colours. Manitoulin is a unique place where ancient native legends combine with historic sites and beautiful scenery to provide an unforgettable vacation experience. The pace of life is slower and more simple here allowing for a peaceful relaxing holiday atmosphere. 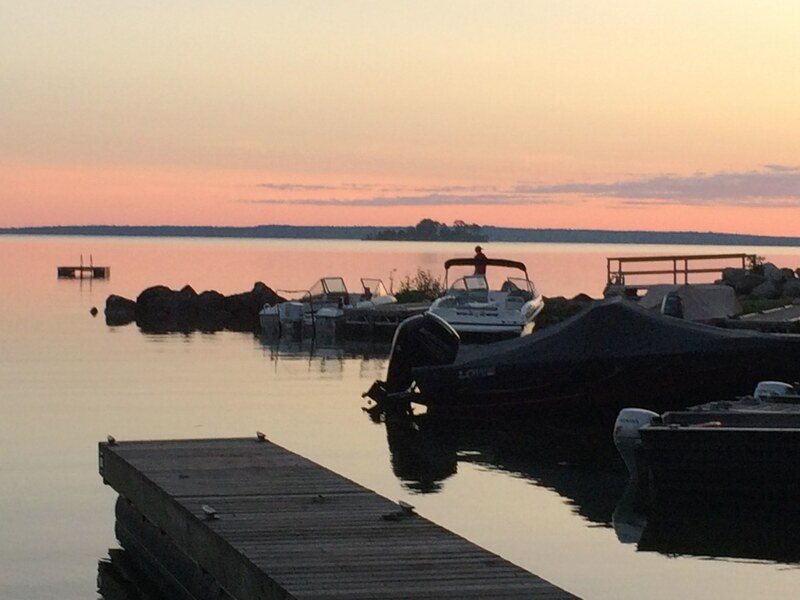 After a few days, the magic of Manitoulin takes over and you find yourself relaxing, slowing down, and taking time to enjoy the beauty which surrounds you. Crystal clear lakes, abundant wildlife, birds, and winding scenic roads lead to new discoveries at every turn. 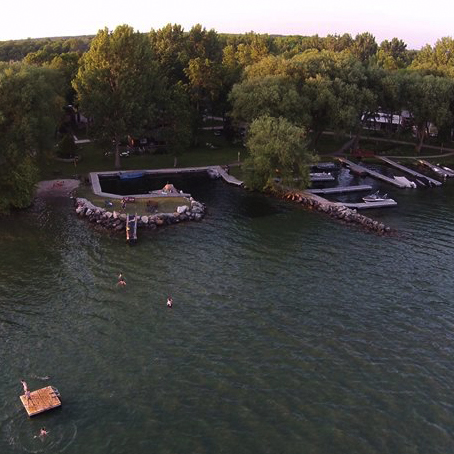 Six fully equipped deluxe housekeeping cottages nestled among mature trees with a view of Lake Manitou. Each cottage boasts a fireplace, electric heat, fully equipped kitchen, microwave, gas barbeque, three or four-piece bathroom, and all the bedding. Spacious grassy sites, most of which have electricity and water. Each site has a fire pit, picnic table and nearby clean, modern washrooms with hot showers and flush toilets. Swim, snorkel, or cast your line in the crystal clear lake, explore your surroundings by kayak, canoe or paddle boat. Challenge each other in a game of pool at the rec hall. Join in on one of our very special events. Become a kid again! Enjoy the annual Wikwemikong Cultural Festival, play a round of golf at the Rainbow Ridge Golf Course, go horseback riding at Kicking Mule Ranch, or enjoy one of the local area museums. 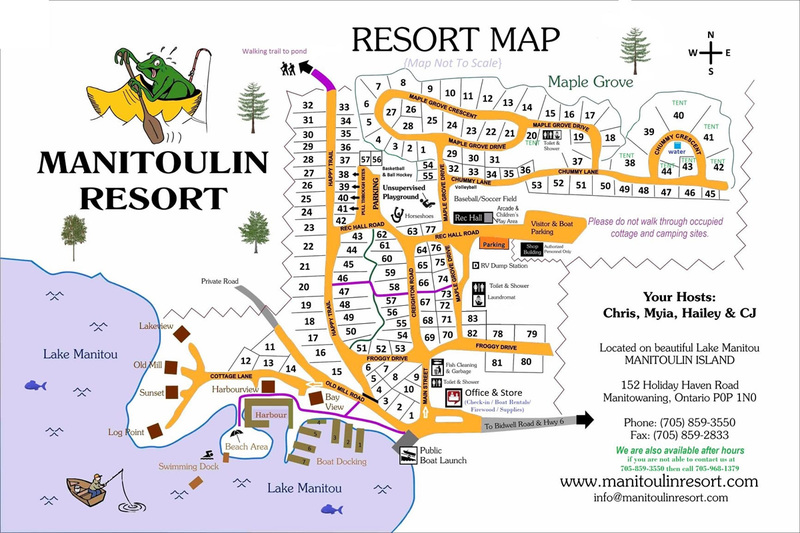 Manitoulin Resort is approximately 1 km off of Hwy 6 on Holiday Haven Road, located on the beautiful shores of Lake Manitou. All amenities are close by in the town of Manitowaning, located only 5 minutes from the resort. Approximately a 20-30 minute drive. After crossing the swing bridge, turn left onto Hwy # 6 South. Drive South until you reach Bidwell Road. Turn right on to Bidwell Road. Take your first left on to Holiday Haven Road. We are on the right near the end of the road. Approximately a 30-45 minute drive. Take Hwy # 6 North until you reach Bidwell Road. This is approximately a 5 minute drive past the town of Manitowaning. Turn left on to Bidwell Road. Been there 31 years...it's paradise!!! Highly recommend it...so much to do with the kids, there are beautiful cottages to rent as well with the most breathtaking views!!!! My happy place, home away from home... Great place to relax with friends and family!!! Fantastic place!! Extremely well maintained and there was nothing we did without. The cottage was beautiful!! Highly recommended!! We just wanted to let you know how much we enjoyed our stay. We were so pleased as to how clean and quiet your facilities were . Your staff was so helpful when we arrived. This was our first trip to Manitoulin but it will not be our last. Our next stay will defiantly be longer to enjoy the island more . We will be highly recommending your park to anyone traveling through there. Again Thank you so much! Just wanted to thank you for a wonderful holiday!! We stayed in the Old Mill this past week and we all had a great time. Kids are already asking when we can go back. Thanks again!